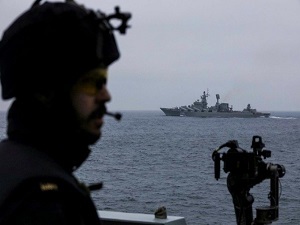 After concluding a refueling stop at the Spanish enclave of Ceuta on November 12, Russian Navy cruiser Marshall Ustinov continued its voyage home and is now transiting the English Channel, under the watchful eye of Royal Navy frigate HMS St Albans. The Sava-class is en route to its Northern Fleet homeport in Severomorsk. Type 23 frigate HMS St Albans is currently tasked with protecting UK waters and has been activated to keep watch on Russian cruiser. Marshall Ustinov is returning home after Mediterranean Sea operations off the coast of Syria. In early August this year, Royal Navy destroyer HMS Diamond escorted Marshall Ustinov and destroyer Severomorsk as they transited the English Channel southwards.